A photograph of St. Boniface Cathedral, taken from across the flooded Red River during the 1997 flood. 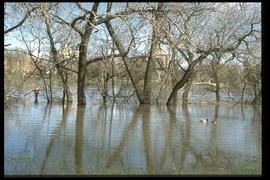 A photograph of the confluence of the flooded Red and Assiniboine Rivers during the 1997 flood. A photograph of several people standing on an earthen and sandbag dike on Turnbull Drive during the 1997 flood. A photograph of several boats pulled up on an earthen dike on Turnbull Drive during the 1997 flood. A photograph of a flooded house on Turnbull Drive during the 1997 flood.